Have you tried to find natural body care only to be overwhelmed by choices or to discover it didn't work for you? If so, our MightyBody subscription is for you! Every month you'll receive one handpicked, MightyNest-tested, safe body care product that actually works for your body. 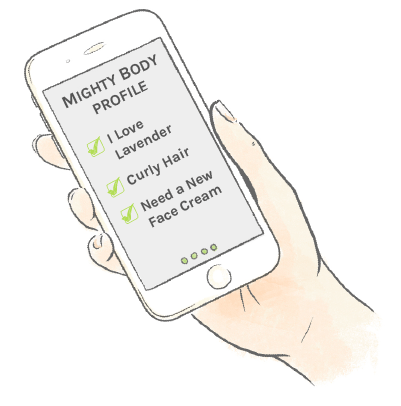 Complete your MightyBody profile to help us understand what you love, what you would rather avoid, and the types of products that works for your body. Discover one better body care solution each month. Our experts will send you one handpicked product. Unlike sample programs, each is full sized and comes with tips to help you find the healthiest, greenest solution that works for your body. In less than 2 minutes you can join our community of 100,000+ making their home, body and world a better place! 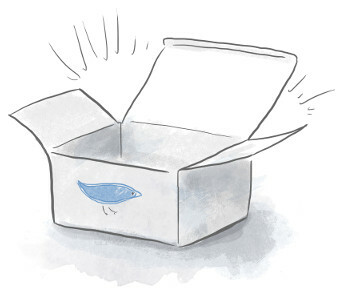 Where Should We Ship your Mighty Body Boxes? As a member, you get free shipping with anything you add to your shipment (only available in US contiguous 48 states). Need dishwasher detergent or sunscreen? Just throw it in and it'll ship for free in the same box as your next MightyFix. When you add an item to your cart, you will be give the option to ship it with your next box or to ship it now. (If you don't see that option, be sure to log into your account with the Login link at the top of the page). 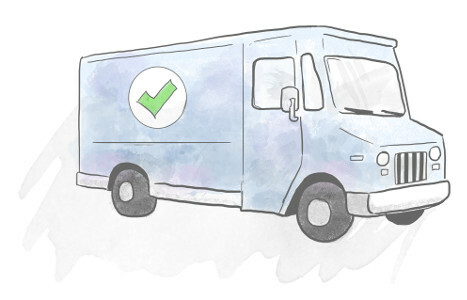 At checkout, there is also an option to move any items in your cart to ship with your next box. Feel free to add or remove items during the month and when your subscription bills, so will any Add-On items. If I live outside the US contiguous 48 states, can I still subscribe to MightyBody? Yes! MightyBody is available outside of the contiguous 48 states in the US. For US addresses outside of the contiguous 48 states, we cannot offer free shipping on add-on orders. See our shipping details for more details about the shipping to your state or territory. For Canada and Australia, a small shipping fee ($3 CAN and $4 AUS) will be applied to each month to cover extra shipping fees. Unfortunately, we are also unable to offer free shipping on Add-On items to international address. What preferences are there for me to shape what I receive? Your MightyBody Profile helps us choose the best products for you. You can choose favorite fragrances, mark fragrances you dislike, choose categories where you would like to try new items and mark categories where you are not interested. You can also share with us basic information such as your skin type, hair type, oral care preferences, if you have sensitive skin, and if you are vegan. We will select the best MightyBody items that fit your profile and improve as we learn more about what you like. We do not recommend relying on preferences if you have an allergy to an ingredient that is common to natural body care products as we are not currently setup to screen for allergies. If I don't like something I receive in my MightyBody shipment, can I return it? We know every body is different. Our experts have hand-picked the best body care for different body types, but occasionally one won't work for yours. You probably have a shelf full of failed products just like we do! While we don't accept returns on opened MightyBody items, if one does not work for you, please call us at 847.905.0567. Our goal is to help you find natural body care that works, so we will do everything we can to help you find a solution that is a better fit for your body. When I subscribe to both the MightyFix and MightyBody what happens? When you add MightyBody to an existing MightyFix subscription, we will ship both items together whenever your box processes each month. We will also make sure that your MightyFix is NOT a body care product so that you only receive one body care item in any month. Any item you have purchased in the past or received through the MightyFix will NOT be sent in your MightyBody subscription. Each MightyBody item will be something new to help you discover the body care that works for your body. Beyond that, everything works the same! Does MightyBody include any items geared for babies or children? MightyBody is designed for adult women and does NOT contain items for kids. The item is intended to help you find the body care that works the best for your body without compromising your wellness. If you are looking for items for kids, we have different bundles you can buy separately for babies or children. My credit card expired, how can I update it so that I can keep receiving these amazing body care solutions? To update the credit card that will be used with your MightyFix: 1) Login to your MightyNest account and go to "My Account" 2) Find the "Billing Information" section 3) Click "edit" and enter your updated card information. You should be able to quickly update the credit card number or expiration date. If you have any trouble finding that option, just call us at (847) 905 - 0567 or reply to one of the MightyBody emails to tell us you need help. Managing your subscription is simple. Just login to your MightyNest account, and you can manage your subscription from https://mightynest.com/account. You can change frequency, pause, cancel, resume, and change shipping address or billing details in just a few clicks. I'm allergic to X, can I still try MightyBody? If you're allergic to an ingredient common to body care products, we do not recommend joining MightyBody. We use your preferences to choose the best products, but this is not comprehensive enough to guarantee that we will not send you a product that contains an ingredient or fragrance to which you are sensitive. We would still love to help you find body care that works for your body. Give us a call at 847.905.0567 and we'd be happy to talk about the products that are a good fit for you.